An exclusive safari for a maximum of 9 travelers who will visit Kenya's three top wildlife ecosystems by private plane. Including destinations both north and south of the equator, the Kenya Connoisseur Safari showcases the country's incredible natural and cultural diversity, and abundant wildlife, with some of the best accommodation and guiding that Kenya has to offer. Upon arrival at Nairobi International Airport you will be met and transferred to Hemingways Hotel. Set between Nairobi National Park and the Ngong Hills, Hemingways is an exclusive boutique hotel in a serene setting on what was once Karen Blixen's farm. With just 45 suites, extensive facilities, and a sophisticated ambience, this is the perfect starting point for a connoisseur's exploration of Kenya's safari highlights. Your relaxing evening at Hemingways includes dinner. After breakfast at Hemingways, transfer to Wilson Airport and fly by private plane to Meru National Park, spending the next two nights at Elsa's Kopje on a fully inclusive basis. Meru is one of Kenya's hidden gems, part of a 370,000 acre conservation area and hosting a greater diversity of wildlife species than any other Park in East Africa, but home to just one permanent safari camp. Elsa's Kopje is unashamedly romantic and elegantly sculpted into Mughwango Hill, above the original campsite where George Adamson raised and released orphaned lions (most famous of which is Elsa, star of the book and movie "Born Free"). Lying 6 miles north of the equator, Meru Park is home to all of Kenya's unique "northern specialty" species as well as a thriving rhino sanctuary, making it one of the best places in Kenya to see rhinos in their natural habitat. The Park is also famous for its lions and large elephant herds, and guests have the opportunity to explore Meru's abundant wildlife by day and night game-drives and walking safaris. After your morning game drive and lunch at Elsa's Kopje your private plane collects and transfers you to the Loisaba Conservancy, arriving in time for afternoon game-drive and evening cocktails. Spend two nights at Loisaba Tented Camp on a fully inclusive basis. The 56,000 acre Loisaba Conservancy is part of a vital wildlife corridor connecting Mount Kenya with the African Rift Valley, managed in partnership with The Nature Conservancy. Falling in a transition zone between Laikipia's fertile grasslands and arid Samburuland, Loisaba is home to wildlife species from both ecosystems, and offers an unrivalled sense of wilderness and adventure. Boasting one of the most dramatic views in Kenya, Loisaba Tented Camp offers elegance and luxury to complement the rugged beauty of the landscape. 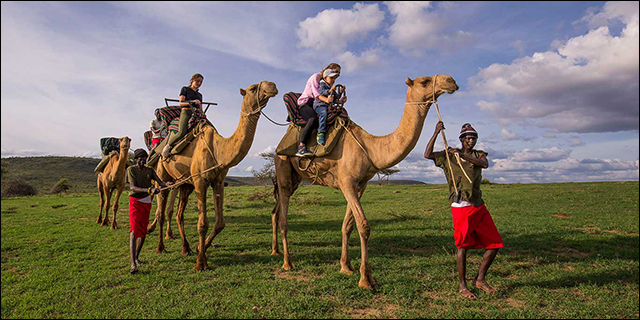 Return from a camel trek or horseback safari to enjoy cocktails by the fire, overlooking the vast panorama of the Laikipia Plateau; awake to sunrise over Mount Kenya before heading out on your morning game drive or walking safari. Round off a day or exploration and discovery with a visit to a nearby Samburu village for an authentic insight into one of Kenya's most traditional cultural groups. After morning game drive and lunch at Sand River Camp, your private plane collects you and transfers you to the Maasai Mara, arriving in time for an afternoon game drive to camp followed by "sundowners" and dinner. Spend two nights at Sand River Camp on a fully inclusive basis. The Maasai Mara is one of Africa's iconic safari destinations, famed for its fertile plains that host an almost unrivalled concentration and diversity of wildlife - this is the birthplace of safari! From July through October there is also an excellent chance of seeing the vast herds of the Great Migration as they pause to replenish their energy reserves on the Mara's lush grasslands. Sand River Camp occupies an enviable location on the banks of the Sand River, in a picturesque and secluded part of the Mara. This classic tented camp recalls the golden age of safari, combining luxury and style with a sense of sophistication and adventure. Activities focus on game-drives with some of the Mara's top guides, to take full advantage of the Reserve's abundant wildlife - this is likely to be the game-viewing highlight of the safari! Enjoy a last morning game drive followed by lunch at Sand River Camp. After lunch your private plane will collect you and transfer you to Wilson Airport in Nairobi, from where you will be chauffeured to Nairobi International Airport, stopping at a top restaurant en route for dinner. Arrive at Nairobi Airport in time for your international departure. Nairobi overnight at Hemingways Hotel, including dinner, breakfast, and selected drinks; all domestic flights, as described, in an executive aircraft; meals, activities, laundry, and selected drinks at the three safari camps; all Nairobi transfers, as described; all Park fees, conservation levies, and departure taxes. Scheduled flights to and from the starting and finishing points of the safari, visas (currently $51 per person), compulsory travel insurance, gratuities, optional extra activities (e.g. hot air ballooning in the Maasai Mara), all personal purchases (incl. curios, telephone calls, etc), pre and post safari accommodation, meals, or tours.